From new construction to expansion, repair and maintenance, Apex Companies is your source for all of your warehousing dock equipment needs. We apply our extensive experience along with our large variety of product solutions to keep your docks running efficiently and safely while keeping your project budget in line. Apex will help you select the right equipment for your unique warehousing environment control needs. 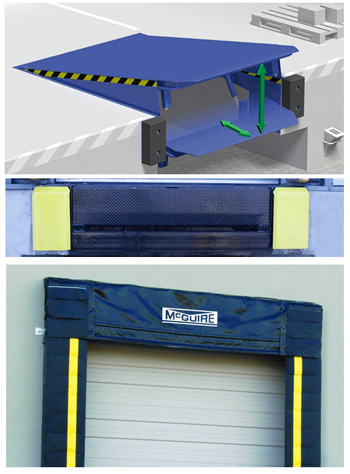 Apex is a premier supplier of loading dock equipment in the Chicago, IL region though we service the full United States. We specify superior products from trusted manufacturers in all price points. Our expert technicians can install, inspect and repair or replace your dock equipment to keep your warehouse storage operation safe, efficient and productive. We are familiar with all industry standards, particularly for food and manufacturing and will help you determine the necessary products for your warehouse docks. Helping you achieve maximum material handling results is our goal. Contact our knowledgeable dock equipment specialists today and we’ll get started selecting the right dock equipment for your warehouse storage facility.